Memphis theater to stop screening "Gone With the Wind"
A Memphis theater has canceled a long-running screening of "Gone With the Wind" over criticism of the film's racial insensitivity. For the past 34 years the Oscar-winning Civil War drama has screened as part of the Orpheum Theatre's annual summer film series. It was last shown on August 11 -- the same night that white supremacists marched on the University of Virginia campus in Charlottesville, and the eve of a "Unite the Right" rally of neo-Nazis, white supremacists and Ku Klux Klan members. That rally -- ostensibly to protest taking down statues dedicated to the Confederacy -- devolved into violence, resulting in a counter-demonstrator killed and dozens injured. Even before the events in Charlottesville, online commentators had engaged in heated discussion about the film. Based on the Margaret Mitchell bestseller, "Gone With the Wind" tells the story of Scarlett O'Hara and her life on a Georgia plantation. One of the most popular movies ever made and the recipient of eight Academy Awards, it is a masterful depiction of love and ambition during a time of war and Reconstruction. But the movie also has a gauzy view of the Antebellum South and its economy built on the slave trade. 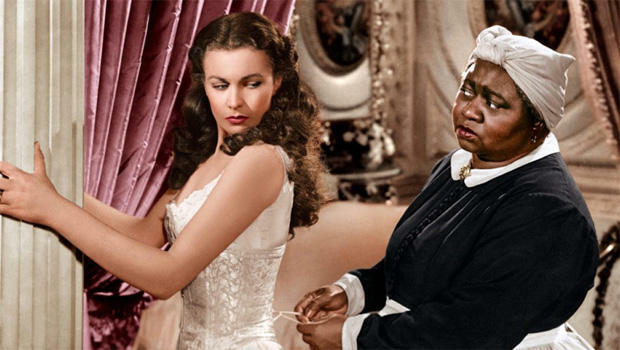 One of the film's most appealing characters is Scarlett's slave, the maternal Mammy, played by Hattie McDaniel (the first African American actress to win an Academy Award). But other black characters (such as young slave Prissy) are presented more as stereotypes, and the cruelty of slavery barely exists on screen. Charles McKinney, a professor at Rhodes College in Memphis, posted online the rundown of this year's Orpheum summer series of more than a dozen films (such as "Breakfast at Tiffany's," "Dirty Harry," "The Princess Bride," "Grease" and "The Rocky Horror Picture Show"), only two of which feature any prominent African American characters -- "Gone With the Wind," and the Eddie Murphy comedy "Coming to America." On Friday officials at the Orpheum announced that they will not screen "Gone With the Wind" during next summer's series. Theater president Brett Batterson said in a statement that the recent showing of the film generated "numerous comments." "As an organization whose stated mission is to 'entertain, educate and enlighten the communities it serves,' the Orpheum cannot show a film that is insensitive to a large segment of its local population," Batterson said. Batterson told the Memphis Commercial Appeal that the decision to cancel the annual screenings had been made before Charlottesville. "This is something that's been questioned every year, but the social media storm this year really brought it home," he told the paper. The announcement has prompted a backlash. On Facebook, Scott Tobin wrote, "A ban that starts with 'Gone With The Wind' could end up with a ban of 'Rocky Horror,' and include along the way the films of Mel Brooks, Spike Lee, Sidney Lumet, ad infinitum. Please do not make the Orwellian mistake of banning movies." Terri Raye wrote, "You'll do Rocky horror but not Gone With The wind???!!!!!!!!! The world has literally gone to HELL." Kelli Lyn suggested the Orpheum screen "1984" and "Fahrenheit 451" in its place. And Dawn Kimberly, responding to the theatre's announcement of a "full-figured fashion show" in September, wrote, "This discriminates against thin people! Shut it down!"